There are many different destinations students can choose from when it comes to booking their Spring Break travel plans however none seem to compare to the “Spring Break Capital of the World” Panama City Beach Florida. 1. Price: Let’s face it, students do not have loads of free cash sitting around and the money they do have needs to be put to good use. Panama City Beach will not break the bank like some international destinations will. 2. The Beach: Consistently rated one of the top beaches in the world Panama City Beach has miles of sugar white sand to catch some rays on. 3. Clubs: Some of the BEST beach clubs and night clubs call Panama City Beach home and the best part is that they are open until 4 am each night. Also you only need to be 18 years old to get into these clubs and party all night long. 4. Location: Panama City Beach is located on the emerald coast of the Gulf Of Mexico and is easily traveled to by car from most anywhere in the U.S. If you prefer to fly, the brand new North West Florida International Airport is a stones throw from the beach. Don’t believe us? 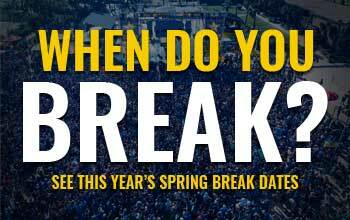 Ask one of the 500,000 students that choose Panama City Beach each March as their Spring Break destination of choice why we rule! Then visit http://pcbeachspringbreak.com/where-to-stay/ and book your trip so that you can join in on the action for 2012. See you on the beach!